Separating raw manure with a decanter centrifuge is an interesting option for farmers who produce more phosphate than they can use on their own farm. The separation process involves concentrating nutrients, mainly phosphorus, in the solid fraction. Thanks to the decanter centrifuges of the Mammoth series, more than 70 % of the phosphate can be separated with the cake, without any added chemicals. At present, Lower Saxony and North-Rhine Westphalia suffer from a serious discrepancy between the amount of nutrients produced in animal husbandry and the quantities that can be used as fertiliser on farmland. Pig manure is a particular problem, since pigs are permanently housed and several industrialised farmers in these two German states have no farmland, or only a small area, on which to spread their manure. Pig farmers and biogas co-digestion plants in the region are consequently looking for solutions to take care of these excess quantities of phosphate. Pig manure contains approximately 7500 mg of N/l and 4500 mg of P2O5/l. According to the European Manure Regulation, the addition of nitrogen from manure to grassland is limited to a maximum of 170 kg/ha. For phosphate, the limit is 50 kg. This manure can be separated into a solid and a liquid fraction using a Pieralisi decanter centrifuge or a screw press separator. The separation process involves concentrating nutrients, mainly phosphorus, in the solid fraction. The table shows that the centrifuge is much more successful at separating phosphorus. The results for both techniques are achieved without any added polymers; they are significantly better with the Pieralisi decanter centrifuge than with a screw press separator. Users acquire two valuable products in this way: a solid fraction containing up to 18 kg/t of phosphorus and a customised liquid fraction with phosphorus levels below 1000 mg/l and an NP ratio of 5.5. The consistency of manure stored in a tank tends to vary. Mixing the tank contents can be an advantage, but the decanter speed still needs to be adjusted depending on the manure’s characteristics. Automatic operation is possible using an automatic differential speed control. Clever kinematics enable the performance of the primary drive for the bowl and the secondary drive for the scroll to be combined. A further advantage is that a very large differential speed range can be covered for separating various types of manure. Owing to the modular system, users can choose between high clarification performance and very high torques for the dryer solid fraction. 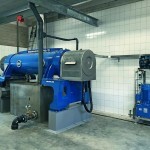 Pieralisi’s experience of manure separation started in the year 1986 with a major manure treatment project in the Netherlands. Since then, the specific decanter design has been regularly improved in terms of reliability, lifetime and performance. Each decanter model can be either fixed or installed in a trailer as a mobile solution for any manure treatment quantity ranging from 1 to 80 m³/h. 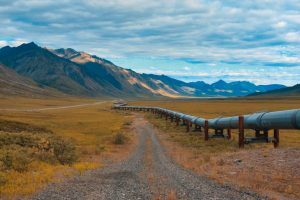 Various modifications to the decanter centrifuges have resulted in a more than 20 % reduction in energy consumption, which is the critical criterion for operating costs and efficiency. 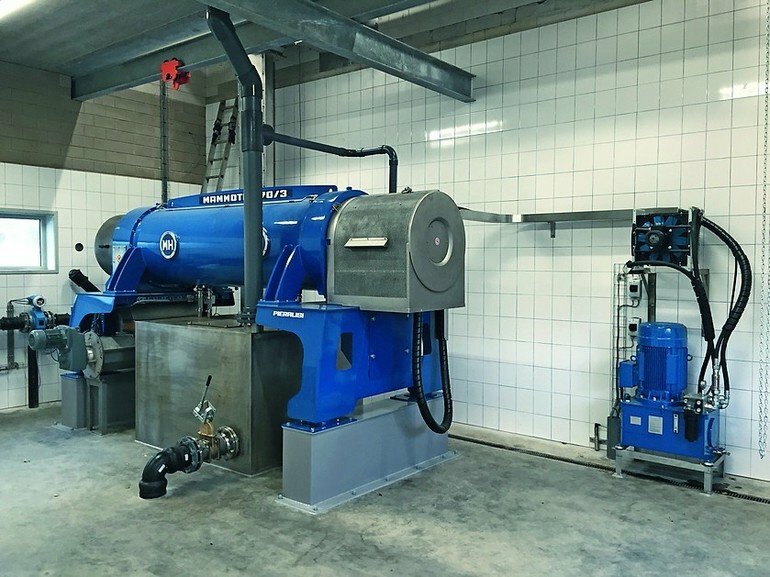 Ever since 2000, Loonbedrijf Verberne has been a pioneer of mobile manure separation solutions in the Netherlands with a Pieralisi decanter centrifuge. More than 70 % of the phosphate is separated with the cake, without any added chemicals. The cake is now used instead as fertiliser – a valuable product. 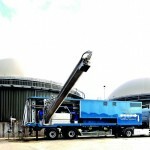 Loonbedrijf Verberne offers up to three mobile manure separation trailers with a Mammoth 570/3 decanter centrifuge. 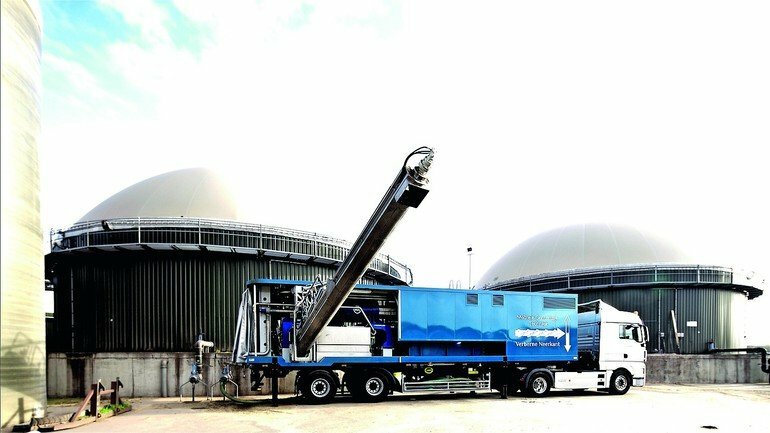 With a total capacity of more than four million kilos of manure per year, the company is the biggest manure separator in the Netherlands. 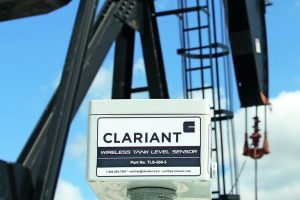 The mobile solution is fully automatic, with the option of monitoring and controlling the decanter by remote access. 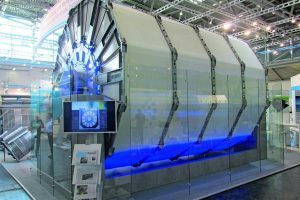 One trailer has a capacity of 40 m³/h and is driven by a Viscotherm full hydrostatic drive in combination with a PLC control panel and ancillary equipment like a macerator, pumps, screw conveyors and a diesel power supply. The decanter centrifuges in the Mammoth series provide solutions to all technological problems of solid-liquid and solid-liquid-liquid separation. The solids and liquids are separated in a cylindrical or conical rotating bowl; the heavier solid phase collects on the periphery and is continually removed by the internal conveyor. A polyelectrolyte can be added to the product when it is fed to the machine in order to improve the separation efficiency. Mammoth decanter centrifuges are fitted with the following standard design features: casing/frame design ensuring minimum vibration and noise levels, slenderness ratio up to 5.26:1 providing high clarification length and volume, vibration measuring and monitoring system, stainless steel of a high chemical and mechanical quality, compliance with processing requirements for all parts in contact with the treated product, wear protection for the scroll flights as well as for the product feed and solids discharge zones, automatic operation with minimum energy consumption and an automatic lubrication system managed by the control panel. The electro-mechanical Rotovariator system was developed by Pieralisi to enable automatic differential speed variation. Thanks to this system and the electronic control, which provides automatic adjustment of the scroll differential speed based on the instantaneous load, the decanter can be continuously adjusted according to the characteristics of the product supplied. Since it regulates the torque on the decanter reduction gear to the maximum permitted levels, the transmission gears are protected. Moreover, energy is saved by transferring a part of the torque to the rotation of the main motor.